This volume maps the breadth and domain of genre literature in India across seven languages (Tamil, Urdu, Bangla, Hindi, Odia, Marathi and English) and nine genres for the first time. Over the last few decades, detective/crime fiction and especially science fiction/fantasy have slowly made their way into university curricula and consideration by literary critics in India and the West. However, there has been no substantial study of genre fiction in the Indian languages, least of all from a comparative perspective. This volume, with contributions from leading national and international scholars, addresses this lacuna in critical scholarship and provides an overview of diverse genre fictions. Using methods from literary analysis, book history and Indian aesthetic theories, the volume throws light on the variety of contexts in which genre literature is read, activated and used, from political debates surrounding national and regional identities to caste and class conflicts. 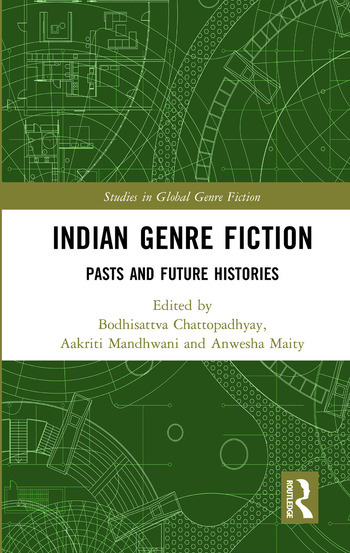 It shows that Indian genre fiction (including pulp fiction, comics and graphic novels) transmutes across languages, time periods, in translation and through publication processes. While the book focuses on contemporary postcolonial genre literature production, it also draws connections to individual, centuries-long literary traditions of genre literature in the Indian subcontinent. Further, it traces contested hierarchies within these languages as well as current trends in genre fiction criticism. Lucid and comprehensive, this book will be of great interest to academics, students, practitioners, literary critics and historians in the fields of postcolonialism, genre studies, global genre fiction, media and popular culture, South Asian literature, Indian literature, detective fiction, science fiction, romance, crime fiction, horror, mythology, graphic novels, comparative literature and South Asian studies. It will also appeal to the informed general reader. Bodhisattva Chattopadhyay is a researcher at the Department of Culture Studies and Oriental Languages, University of Oslo, Norway. He is the Editor-in-Chief of Fafnir: Nordic Journal of Science Fiction and Fantasy Research (Finfar, Finland) and Editor at the Museum of Science Fiction’s Journal of Science Fiction (MOSF, Washington, D.C.). He has formerly taught at the Universities of Oslo and Delhi, and has been visiting researcher at the Science Fiction Foundation at the University of Liverpool and the Evoke Lab (Calit2)/Department of Informatics at the University of California-Irvine. Aakriti Mandhwani is a researcher at the Department of South Asia, Faculty of Languages and Cultures, SOAS, University of London, UK. She works on North Indian middle-class reading practices through the archive of the post-1947 commercial magazine and paperback in Hindi. Her areas of interest include book history, popular literature, intellectual history and urban studies. Her works include articles in Modern Asian Studies and a volume on Hinglish edited by Francesca Orsini and Ravikant Sharma (both forthcoming in 2018). Anwesha Maity is a researcher at the Department of Comparative Literature and Folklore Studies (CLFS), University of Wisconsin-Madison, USA, from where she also obtained her doctoral degree. Her research interests include science fiction and genre fiction, postcolonial criticism, translation studies, and Sanskrit aesthetics. She has published in Science Fiction Studies, Studies in the Fantastic and Jadavpur University Essays and Studies.